The beauty of art is its uniqueness. Art is by definition an expression of the artists' ideas, emotions, ideas and thoughts. Taking this in mind I thought it would be interesting to take an idea and include a myriad of different works expressing that same idea. We'll likely do this from time to time on this site. It will be like our own themed gallery exhibit. For this first art group I've chosen the title "Last Breath" (with occasional variations). All these works were found by browsing the internet, and often it is only the title and work itself that I have been able to find. This leaves the interpretation completely to our imaginations. 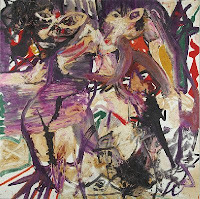 This first piece on the right "Last Breathe"(1989) is by Petar Mazev (1927-1993). He is a Macedonian artist who did this piece during a time of self-isolation, grieving the death of his eldest son. This, more than the other pieces, seems violent. The colors are very bold and to me I see a wolf or something attacking a figure on the left. Cathy Woo is a fine artist who lives in Seattle. Her website states that her paintings "reflect a lifetime spent walking outdoors". 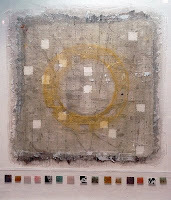 This piece to the left "Last Breath"(2007) is of rice paper on plexiglas. 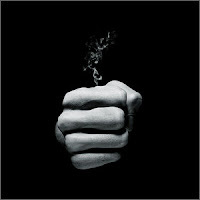 The circle reminds me of a mouth, or the breath itself, shaped like a ring of smoke. From the opposite coast is Helen Hawes who also finds inspiration from nature. She lives in Vermont and her website says she is pursuing an advanced degree in Walking in the Woods. Her work to the right, "Last Breath" is part of a series called "Earth and Sky Lineage". I appreciate the face, expelling that last breath. I see the blue parts in the lighted area as the actual last breath. Though representing more than air perhaps? I found this work to the left on an Austrailian arts site. The piece entitled "Last Breath ??" is by artist Adrienne Conway who won an award for this piece. Reading the judges comments for the award I realized this was actually depicting a whale's breath. When I think about a visual representation of breathing, there is nothing so magnificant as a whale's breath. Contrast Adrienne's piece visually to the digital art piece by ISO25 on the right. From a compostition stand point they are similar. The center is filled with the idea separated by a void of blackness. Both depicting the concept of breath, however, one is an enormous last breath, giving the impression of loudness, while the other a tiny ember of a breath. ISO25 wrote below his piece "Last Breath" the following: "ashes to ashes/dust to dust/the body is mortal/the spirit eternal". His piece along with comments was found here. And finally 2 other similar pieces from nature. The first on the left and on top is a photographic art piece by Colin Shafer called "Last Breath" taken in Mount Kinabalu, Malaysia. The artist writes "An old tree reaches out into the clouds on this great mountain". Very similar to this is Rahul Chandel's digital art piece "Last Breath" to the left on the bottom. Interesting that both artists have used the idea of a barren tree and cloudy skys to represent the ending of life, or the last breath. Collectivley all 7 of these pieces bear the same title, yet they are conceptually quite different. Ironically, I think if I entered an exhibit hall with each of these pieces and no titles, I'd have a hard time looking at them all and coming up with "Last Breath" as the theme.